Is a Christian philosophy possible? 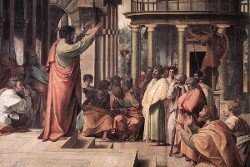 St. Paul's Areopagus Sermon by Raphael. In this magazine, several authors have noted the link between faith and science, the mutual agreement at some points, as well as the importance of taking into consideration the cultural contexts for establishing a dialogue1. In line with these efforts of conceptualizing faith in terms which are linked to scientific development, this article poses the question of whether philosophy, as the mother of all science, can bear the ‘christian’ last name, and its implications. To answer the question about the possibility of a christian philosophy we need to start by tackling the conceptualization of the term ‘philosophy’ (from the Greek phileos= love; logos= order, study, treaty, word?). From the constellation of definitions that come from the word philosophy we can –in a rather rushed manner– reduce this multi-faceted term to four semantic axis: 1) Disciplinary/institutional, 2) Epistemological, 3) Ontological and 4) Dialogical. Disciplinary/institutional axis. That is, ‘philosophy’ understood as an academic and professional discipline. This axis can be synthesized in the satirical aphorism, “philosophy is what philosophers do”, because it is about the unfolding of reflexive thought through the mediation of institutional activities that philosophers do as members of the scientific community2. The adjectives that we could attach to this type of philosophy could be, for instance, ‘institutionalized’, ‘organic’3 or ‘national’. Of course, not all philosophy that philosophers produce has this national reach. Notwithstanding, the publication or books, articles, as well as the position of director or professor of philosophy, and the possession of a membership in the scientific community are indeed touched by the institutional constrain of the State and of the universities organisms and their respective curricula. From this axis, that refers to the institutional practice of philosophy, there can be no christian philosophy, because the scientific and educational institutions are not in themselves christian. This laicization of the institutions has been one of the historical achievements of Latin American liberalism, but more tenaciously defended by political orientations of the left. Despite the fact that the political fundamentalism of neo-liberalism has become more difficult, for example, in the Latin American Christian Democracy, they can go against this political and theological break up between the Church and the State. For this reason, to speak today about christian philosophy as an institutional practice would be a sour event showing civil setback and conservative political totalitarianism. Epistemological axis. According to the epistemological axis, philosophy is a scientific and critical discipline whose goal is to understand the conditions in which knowledge about metaphysical, political, religious… etc., topics is brought forward. Being a science, philosophy cannot be christian either because science, as the neo-intellectualist Robbin Horton says, is characterized for the interdisciplinary criticism that presupposes the epistemological and ontological questioning of any theoretical stance4, whereas christian philosophy centers itself in the intra-disciplinary debate, that is, critical reflection, but without hindering the fundamental ontological tenet: God. It is necessary to note that, despite this, in this epistemological sense there have been attempts of christian philosophies. For example, we can mention the movement which was born in Netherlands since the 1940’s by the jurist Hermann Dooyewerd5 and that has been crystallized in the thus named Reformational Theology6, which has as its fundamental project the development of a ‘christian science’. Thus, not only would we speak about ‘christian philosophy’, but also about ‘christian history’, ‘christian sociology’, etc., as far as these sciences acknowledge and respect its religious motivations coming from christianism; because, according to Dooyewerd, scientific practice is always subjectively filled by a religious motive. Therefore, if science in general has as religious motive the spirit of apostasy that denies in advance divine transcendence, then, Dooyeward continues arguing –and beside him a plethora of Reformational theorists–, why it cannot be possible to develop a christian philosophy and science that in advance recognizes the transcendental act of God? The reason why we answer this question negatively is that christianism cannot wish to create isolated ontical spheres of knowledge7, because, even if we applaud Dooyeward’s pristine acknowledgment about the impossibility of scientific objectivity –of which the scientific sociologists and the diverse social constructivisms very much agree8–, christianism, as Karl said about theology, “is not in itself in the possession of special keys for special doors”9 as some theologies suppose, not only Reformationalists. Therefore, christianism must do philosophy about the reality without epistemological codes supposedly revealed, that is, without taking to the interdisciplinary field its fundamental interdisciplinary proposals. Through this, we are not sending christian philosophy into oblivion, but we are pointing out that if it wishes to establish an interdisciplinary dialogue, it cannot uphold intact its fundamental ontology. One thing is to do philosophy from a christian perspective and another thing is to develop a philosophy over christianism’s tenets, which is where we appropriately speak of a christian philosophy. Thus, if a dialogue with science is sought through a model that is centered in christianism’s theses, diverse requests of beginning should be made: God and the doctrinal affirmations. This is what is happening with creationisms. Through an intra christian philosophy they want to make an inter criticism, and the result is simple: evolutionism is wrong because it does not fit my doctrines. They will never be convinced of the opposite, because they think that the scientific world (inter) must adjust to their previously made ontological presuppositions (intra). Ontological axis. In this axis, it is indeed possible to speak about christian philosophy, that is, the philosophy that assesses and argues the practice of faith and theology. An eminent example of christian theology understood as ontology is the Summa Theologica by Thomas Aquinas, because in it we find the fundamental topics of christian theology and practice from a philosophical perspective, arguing through categories and argumentative styles that were common in Western and Arab scholastic philosophy, but with a focus in strictly doctrinal topics, also ­–doctrinal differences apart, of terminology and arguments–, the Institution of Christian Religion by John Calvin and the already quoted dogmatic work by Barth. They are Christian philosophies inasmuch as they deal with doctrinal subtleties and do philosophy about them, producing theology. Of course, the doctrinal contents that christian philosophy philosophically assesses refer to the entire world and life, but we should understand that it is a world and a life seen from within christian tenets (intra), and that, therefore, they will never be accepted by other perspectives (inter). Dialogical axis. Faith will not be philosophy as discipline, nor as epistemological presupposition that assures beforehand its results, but as a way to understand the world, in daily life, theologically or through scientific dialogue. This is the dialogical axis: to do philosophy and science with a christian perspective. This allows to participate in interdisciplinarity, because we are not thinking that philosophy or science must respect christianism’s tenets, nor that we are only thinking about christianism, but that science and philosophy can have a debate with faith, each one defending their presuppositions and –it is desirable– constantly revising them. In this sense, christian philosophy can assist the dialogue between science and philosophy inasmuch as it could function as the pits in automobiles races: a place to fix, revise and evaluate the state of the vehicle with the purpose that it can go back to the race: interdisciplinary revision for the interdisciplinary dialogue. This article was translated by Nicolás Manfredi and reviewed by Alfredo Francis, under the grant “God's Evolution” awarded to the Science and Faith Centre (Spain) by the BioLogos Foundation (USA).